Cars 3 is the 18th feature from Pixar. In the 22 years that the animation studio has been producing films, many have been marvelous, some were sweet, and a select few were disappointments. But never before has Pixar made a movie that’s felt superfluous. Where earlier misfires were at least nervy experiments or noble failures, the latest chapter in the company’s least-interesting franchise never shakes one’s suspicion that its existence is the direct result of corporate bottom lines and synergistic marketing strategies. It’s certainly the first Pixar film whose commercial success I’m actively rooting against. To be fair, Cars 3 is always wondrous to look at, and its level of cutesy humor is always several notches more advanced than family-film garbage such as Minions and The Secret Life of Pets. Even on a low gear, Pixar’s brain trust generates more superficial pleasures than plenty of its peers. But that’s precisely why Cars 3 feels so egregiously mediocre. To expect a Wall-E every time is simply unfair. But it’s not churlish to note that, where there was once a commitment to delivering spectacular storytelling full of heart and humor, we’re now stuck with a dull technical expertise and some trite life lessons. Ever since Cars came out in the summer of 2006, the series has been critics’ whipping boy, giving Pixar naysayers an opening to loudly declare that the seemingly infallible company wasn’t deserving of such hosannas. The initial backlash to Cars was understandable: After a series of dynamic action-comedies (Toy Story, The Incredibles), Pixar told a gentler, more nostalgic tale of a conceited race car, Lightning McQueen (Owen Wilson), who gets sidetracked in a dying small town, discovering old-fashioned values along the way. 2011’s Cars 2 was a radical reinvention, promoting Lightning’s local-yokel buddy Mater (Larry the Cable Guy) to main character for a spy-thriller involving mistaken identity and international intrigue. It was a clunky, mechanical affair, but at least it demonstrated Pixar’s continued desire to take risks. Now comes the new chapter, in which Lightning is once again at the helm of the story. Ironically, though, Cars 3’s major theme is that our hotshot hero discovers how quickly the limelight can be stolen from him. After years dominating the racing circuit, he faces stiff competition from a new breed of aerodynamic, cutting-edge vehicles that make him look like a relic. Even more humiliating, Lightning is consistently bested by the cocky racer, Jackson Storm (Armie Hammer), who never misses an opportunity to pay lip service to Lightning’s legacy—while driving home the fact that the former champion should retire before he further embarrasses himself on the track. Aging and the accompanying loss of relevance became the emotional lifeblood of Pixar’s most beloved franchise, Toy Story, allowing the series to continue in ways that felt organic and poignant. 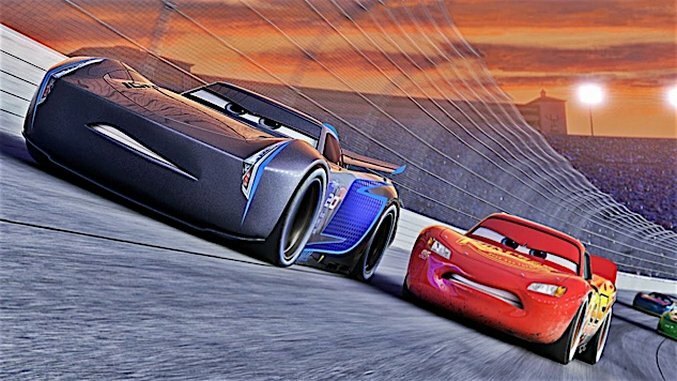 In a similar vein, Cars 3 has the potential to explore the very masculine anxiety of losing one’s edge—especially when it comes to athletic competition—and in Lightning, we have an overconfident protagonist due for some comeuppance. But this sequel ends up containing neither quality that made the previous installments notable. The deeply felt, proudly square sentimentality of Cars isn’t as potent, and the high-octane exuberance of Cars 2 has been toned down. In its place, Cars 3 is stuck in a middle ground that’s largely anodyne. Refusing to believe that his best days are behind him, Lightning meets with Sterling (Nathan Fillion), a wealthy entrepreneur who’s designing next-generation training tools for race cars. Lightning signs up, obsessed with defeating Jackson Storm, and he’s guided in his quest by Cruz Ramirez (Cristela Alonzo), one of Sterling’s trainers. She believes that this once-great racer should visualize success—a touchy-feely attitude that runs counter to Lightning’s burn-rubber, alpha-male aggressiveness. This, again, has the potential to be intriguing—a comedic/dramatic illustration of how old dogs need to learn new tricks in order to grow—but director Brian Fee hasn’t given Lightning a formidable counterbalance to force his change. What’s forgotten about with Cars is that, while its supporting characters may have been familiar small-town types, they exuded such simple decency and sweetness that Lightning couldn’t help but become a better person (er, automobile) around them. In Cars 3, the residents of sleepy ol’ Radiator Springs barely put in an appearance, and the sequel’s new characters aren’t compelling enough to leave an impression. That’s especially troublesome considering that Jackson Storm is set up to be Lightning’s worst nightmare: a racer just as cocky as he is, but superior on the track. Oddly, Cars 3 feels like it’s aspiring to be the Rocky IV of the franchise, pitting an aging winner against a top-flight, younger foe, leading to a battle between combatants that’s also a war between differing philosophies. Lightning trains for a climatic race against Storm, but his nemesis doesn’t show up much in Cars 3. One could argue that this is by design—Lightning’s greatest enemy is, in fact, himself … or, rather, the outdated, inflated vision he has of himself. But for that nuance to really hit home, Lightning would need to be a more interesting character. And this is the dilemma Pixar has never been able to solve. Wilson’s laidback, swaggering performance makes Lightning endearing, but there’s no deeper twist to him—no resonant, universal anxiety that he embodies. Sure, he’s arrogant and needs to learn to be nicer, but the Cars films have always been pretty trite in their handling of Lightning’s growth. Watching him perfunctorily argue with Cruz and reconnect with his dead mentor, Doc Hudson (Paul Newman, in a posthumous role), and Doc’s old trainer, Smokey (Chris Cooper), Lightning remains a perfectly likable presence—and nothing more. These sorts of qualifications didn’t used to be routine with Pixar films. Back in the late 1990s, when Pixar was finding its groove, the company made Toy Story 2, which was initially meant to be a direct-to-DVD sequel until Pixar’s bigwigs decided they didn’t want to settle for something slapdash, producing one of their finest films. Ever since, Toy Story 2 has been rightly held up as an example of how the Pixar team prizes creativity over commerce, demanding the best of themselves—and, in the process, distinguishing their sterling output from that of their cynical, money-grubbing competitors. It would be inaccurate to accuse Cars 3 of lazy commercial expediency. Young viewers may walk away appreciating the importance of being selfless. And the sequel contains some grace notes concerning mourning those you’ve lost and appreciating when your moment in the spotlight is over, ceding the fanfare to others who never got their chance. But for the first time in its storied history, a Pixar movie feels like a straight-to-DVD entry: undemanding, mildly amusing, utterly disposable. I wouldn’t put it past Pixar to reclaim its former greatness. (Inside Out and Finding Dory both contained plenty of ingenuity and soul.) But as the studio continues to focus on sequels, Cars 3 serves as a sad reminder of what was once so brilliant about the company’s films. Sure, it’s still preferable to a lot of other animated movies out there. But the gap isn’t as wide as it once was.